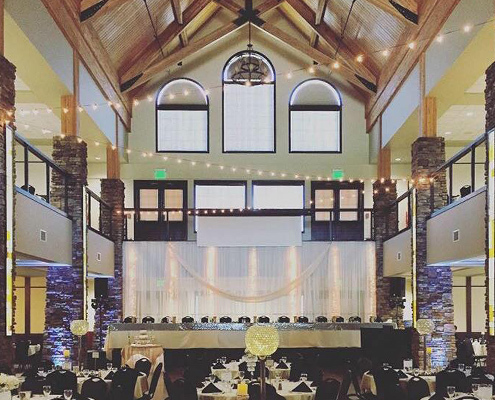 At Prairie Winds Event Center you pay for the facility fee plus a full service cleanup fee and we take care of the rest! We will offer you everything we have on location for you to use. This includes a customized order you submit to us from a wide selection of colors for your table linens and napkins. Along with a portable stage, tables, chairs, china, silverware, glassware, stemless wine glasses, audio/visual equipment, and much more! The entire facility includes the lobby, east wing, west wing, ballroom, upper level,and kitchen. *****For your safety Prairie Winds requires you to pay a service fee for hanging any lights in the 2018 year. You may rent lights from Prairie Winds or bringing in your own but a $40.00 fee will apply with either option if lights need to be hung up. -This amount should be paid on the date of the event OR before. Holiday Rates are a $200.00 increase in facility rates. May we bring in our own snacks/non-alcoholic beverages? Yes! You may bring in snacks, baked goods, and/or non-alcoholic beverages for no-added cost. Do we have to utilize a designated caterer for our meal? No. You are allowed to utilize anyone with a catering license for your meal. A catering license and proof of insurance is required from said business/person before catering the event. Do we need friends/family members to help with snacks, drinks, desserts, or gifts? No. Prairie Winds event staff will set-up and refill all the snacks/drinks that you have provided for your guests. We will also watch and refill snacks/drinks as needed. Gifts will be attended to and locked away by Prairie Winds staff. Desserts will be plated/refilled as needed by Prairie Winds staff. What are we in charge of cleaning at the end of the event? Any decorations, leftover food/beverages, and any other items you brought in with you at the beginning of the event is needs to be taken out with you after the event. Cleaning of the facility, tear-down of tables and chairs, taking out trash, and washing dishes is all done by Prairie Winds staff. Do we need to supply coffee or punch cups for the event? We will supply the coffee cups, carafes, creamers and sugar for the coffee. You will need to bring in cups for any punch or lemonade; you can buy these in bulk at Costco or Sam’s Club. What time can we get into Prairie Winds to decorate? If there isn’t an event the day prior to your event, you may come in between 10am-4pm to decorate. If there is an event the day before, we will open the doors at 7am the morning of. All tables/chairs will be in place, linens on tables, napkins folded, and tables set with chinaware/silverware before you come in to decorate. May we play a video or have a slideshow? Yes! We have three projectors and screens: one in the middle section and one in each wing. Videos/slideshows can be brought in on a flash drive or computer, and Prairie Winds staff will play it at the designated time. We ask that you bring in the video/slideshow earlier in the week to be tested on the system. Are real candles allowed, or are there any decorating restrictions? You may use real candles for your event. All open-flame candles must be in a votive or on a plate. Prairie Winds staff will light/turn on any candles prior to the event. We do not allow any fog machines, bubble machines, or dry ice within the facility. Do you supply linens for all the tables? Yes! 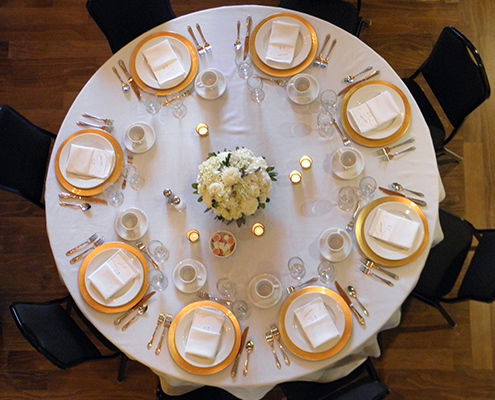 We have white, black, or ivory linens for all the tables provided. We also have black and white skirting available as well. Do you provide chairs for an outdoor wedding in the pavilion area? What is your policy for moving an outdoor ceremony inside due to weather? 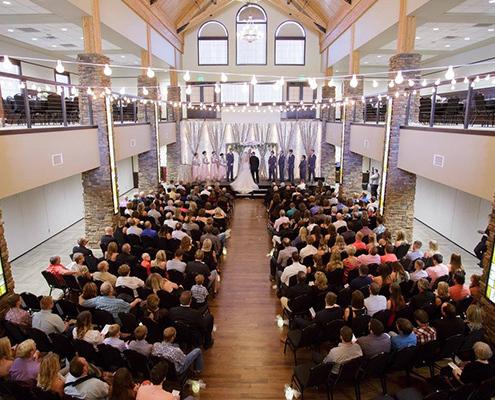 If you wish to have ceremony style seating indoors, we need a 24 hour notice prior to your event date. 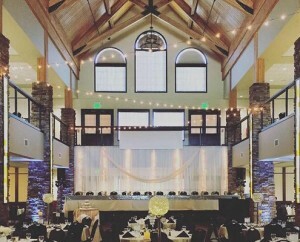 If you wish to wait out the weather and move ceremony indoors in less than the 24 hour notice, guests will sit at their tables and an aisle will be made for the ceremony.